How do you capture the moon's majesty in song? Astrophotographer Stephan Kogelman captured this photograph of the August 2014 supermoon on the Island of Bonaire in the Caribbean, off the coast of Venezuela. As you settle in Sunday night (Sept. 27) to watch the supermoon lunar eclipse, kick back with some moon tunes as chosen by Space.com's staff. The moon has always fascinated humans, ever present and ever changing in the sky, and that fascination has inspired countless moon-based melodies. A full moon can mean romance or chaos and disaster; a thin silver sliver spells mystery, changeability or tranquility. What might a supermoon lunar eclipse represent? The infographic pulls out classic moon tunes, songs about the Apollo moon missions, and even songs for a rainbow of multicolored moons (from "Red Moon" by The Walkmen down to "Kiko and the Lavender Moon" by Los Lobos). It also includes songs for geographical moons rising over dozens of American states, plus Australia ("Sorrento Moon" by Tina Arena) and Cuba ("Havana Moon" by Chuck Berry). To prepare for Sunday's eclipse, check out Space.com's viewing guide or catch up on the science behind it. The moon won't completely disappear — it will take on a reddish hue after it falls into Earth's shadow. The total eclipse will begin at 8:11 p.m. EDT (0011 GMT on Sept. 28) and stretch for 72 minutes. So if you're in it for the long haul, you'll have plenty of time for a lunar playlist. NASA's Steven Williams listed classic, colorful and geography-based moon songs in an infographic for the Planetary Science Division. 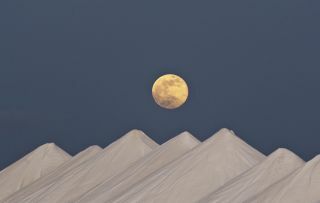 You can learn more about the moon in song by NASA at: http://moon.nasa.gov/moonsongs.cfm.